We just recently saw a video comparison test between the Audi Q7 2.0T, Volkswagen Atlas R-Line and the Acura MDX. In that test, the Q7 won, thanks to its superior performance, nicer cabin and better ride. Now, though, CNET’s Roadshow has done a full review of the very same Q7 that was tested by TFLC against those aforementioned competitors. So this review is also of the Audi Q7 2.0T Quattro and it actually seems to be the very same Q7 press car as in the TFLC video. And that’s good because this specific Q7 is a pretty low-spec model. It’s riding on standard suspension with 18″ wheels and, of course, it has the 2.0 liter turbocharged TFSI four-cylinder engine. Most enthusiasts will scoff at the idea of a three-row, nearly three-ton SUV with only a 2.0 liter four-cylinder engine. However, it does an admirable job of moving the Q7 around. It makes 252 hp and 273 lb-ft of torque, paired with an eight-speed automatic, and it’s more than enough for daily, luxurious driving. Inside, the Q7 is still a very nice place to be, as always. This specific tester’s Nougat Brown interior is lovely and the wood trim looks expensive. It’s a nice looking cabin and it even features a ton of space. 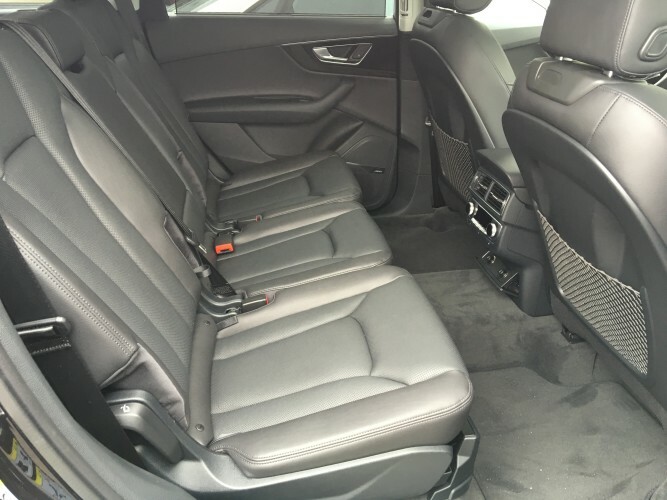 The second row is spacious and features sliding/reclining seats and even the third row is big enough for kids. That third row is too tight for adults, though. As far as tech goes, the Audi Q7 has all of the same tech you’ll find in most Audis. 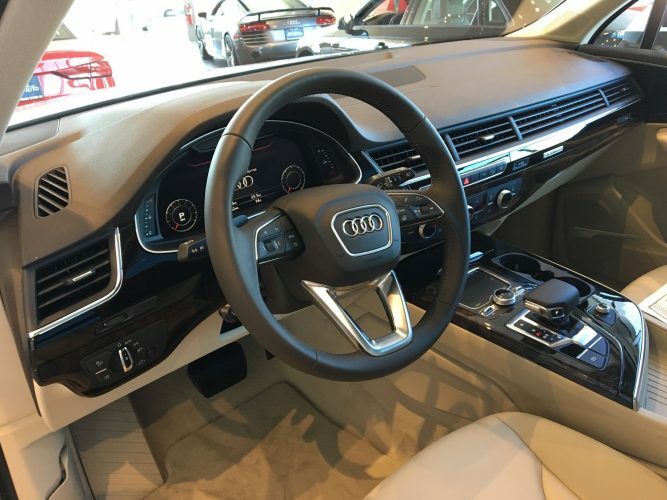 So it features Audi’s normal MMI system, not the new touchscreen unit in the Audi A8, and the brilliant Virtual Cockpit. The latter of which puts the Q7 ahead of its rivals, in terms of tech, by itself. But it also drives really nicely, with a comfortable suspension and quiet cabin. What’s interesting is that, on the smaller wheels and thicker tire sidewall, the Q7 actually rides quite nicely, despite not having adaptive dampers or air suspension. The Audi Q7 is already a few years old but it’s still an excellent all-around SUV and one that should seriously be considered in the segment.